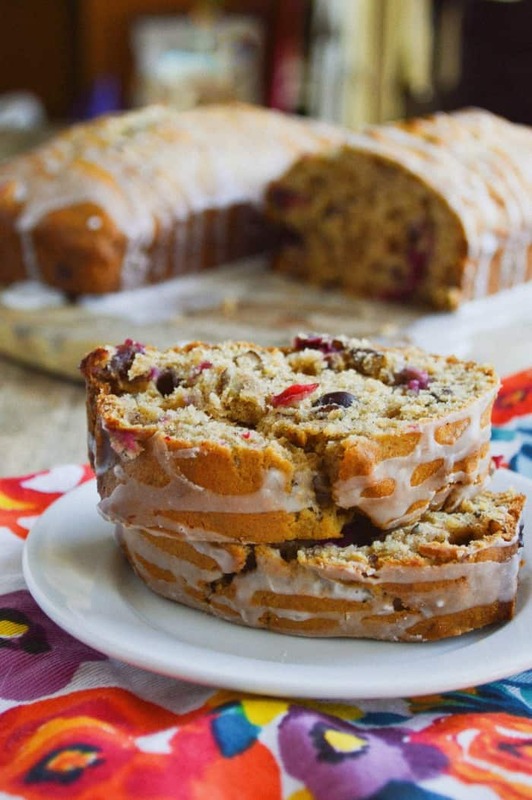 Cranberry Pecan Banana Bread is slightly sweet, a little tart, and deliciously nutty. 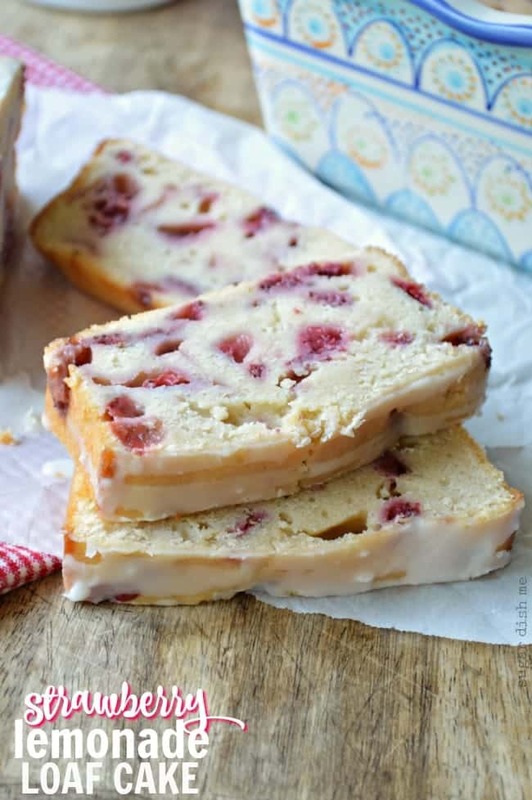 This easy quick bread works well with fresh or frozen cranberries and has a pretty glaze on top that makes is perfect for company! Or yourself. You can totally keep this all to yourself. Update January 2018: I had a reader leave the nicest comment on this post ( thanks, Sandra!) and decided it was high time to update these photos. And that means that I got to remake the recipe. I didn’t change a thing here, but have added a few fun substitution options in case you are like me and hate going to the grocery store to make a recipe that inspires me. 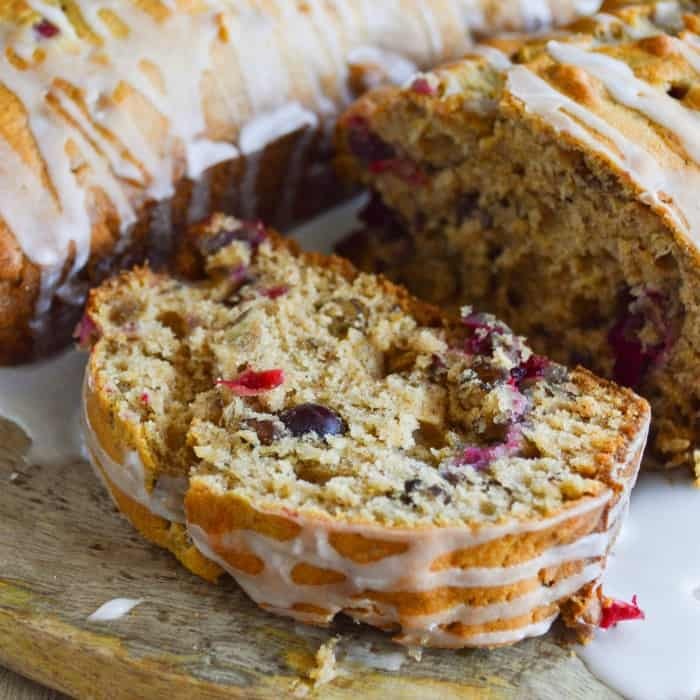 This Cranberry Pecan Banana Bread is still awesome and I was super happy to have it with my coffee on a crisp Sunday morning. I’d also forgotten about this story about my kid who was 10 at the time. Glad I wrote it down. Anyway – ENJOY! And sometimes you have to listen really hard for the truth. The other day I got a phone call just after lunch – it was the nurse from the elementary school. So I listen to her tell me that she has my son in her office and that he seems fine but he says that he is feeling a little dazed from when he fell off his bike yesterday. I am definitely nominated for Mom of the Year when I clearly have no idea what she is talking about. So she says I can talk to my guy. I did. He gave me a very long winded description of hitting a rock coming up the hill and hitting his head. The problem is that where he says he hit his head is smack in the middle of his forehead, and I distinctly remembered seeing a scratch there that did NOT look like pavement but more like he was all up in Norma Kitty Jean’s personal space. So I tell the nurse that I think Evan will probably survive the 2 hours he has left at school and we hang up. Evan has no doubt moved on by the time he got home from school and I caught him off guard. One thing I know for sure is that you need this bread. No tall tales there. 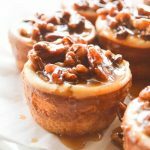 It’s moist and full of banana flavor with a little tartness from the cranberries and a slight crunch from the pecans. It’s an easy quick bread that comes together quickly without much fuss. 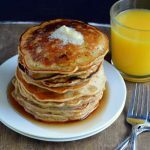 Makes a great hostess gift or Thanksgiving breakfast, and will happily be your breakfast while you race around in the car. 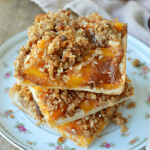 I originally published this recipe in November 2013, so I had fall and Thanksgiving on the brain. But really, this recipe is GREAT year-round. I do this thing EVERY YEAR around the holidays where I get a little overzealous and buy too many bags of fresh cranberries. And then in late December/early January I have to play this WHAT CAN I USE CRANBERRIES IN?!! game. So I had fresh cranberries handy. They are usually seasonal, though. 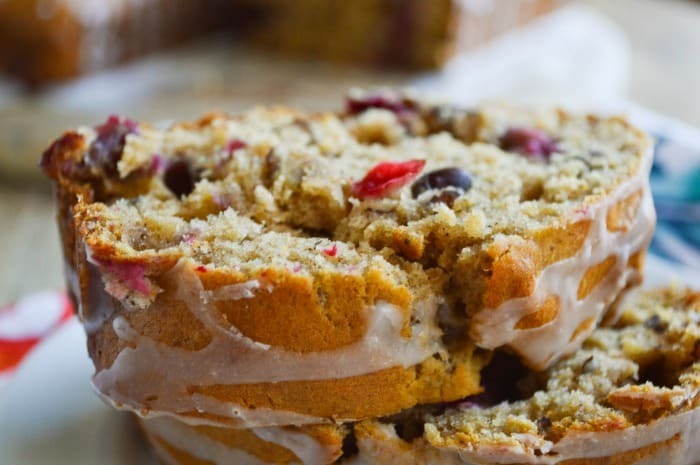 So you can absolutely make this Cranberry Pecan Banana Bread with fresh OR frozen cranberries. Oh! And I promised you some updated substitutions and tips! If you are like me and can’t get enough banana bread, I have a couple other banana bread recipes you might dig. Elvis Banana Bread has BACON. Yes, Bacon. Healthy Pumpkin Banana Bread is also really popular because y’all like to sometimes cut the calories. 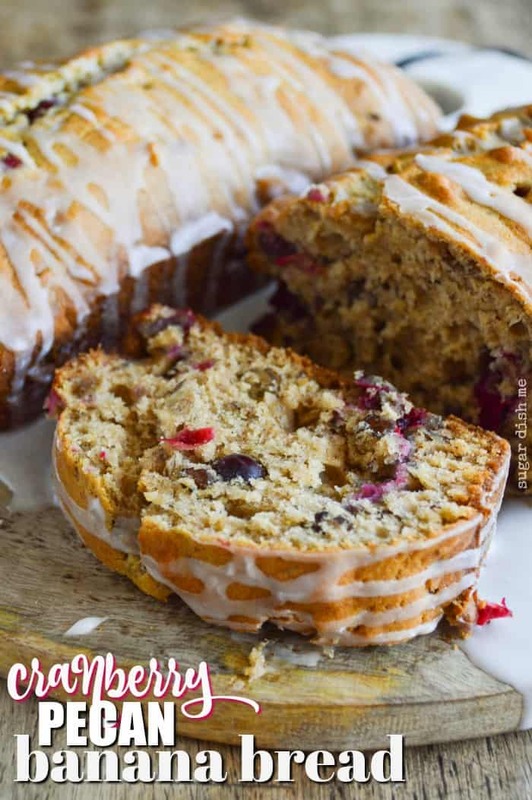 Cranberry Pecan Banana Bread is a delicious quick bread recipe that tastes like the holidays! 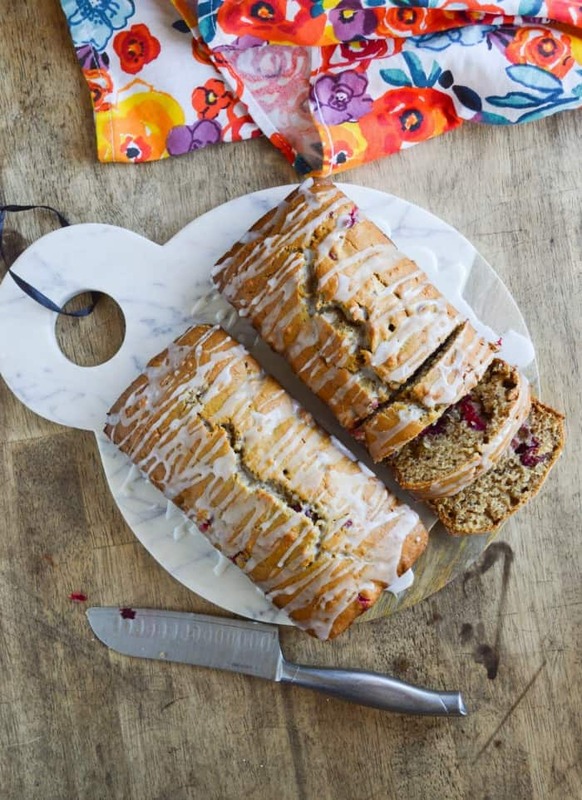 Brown sugar, cranberries, bananas, and pecans make for a moist breakfast bread with a little nutty crunch. Preheat the oven to 350. Butter 2 (8 X 4) loaf pans. Cream together the butter and brown sugar until fluffy. Add the eggs and then the bananas. Mix for about 30 seconds. Add the flour, baking soda, cinnamon, nutmeg, and salt. Stir in the cranberries and pecans. Divide the batter evenly between the 2 prepared pans. Bake for 35- 40 minutes, or until a pick inserted in the center comes out clean. Let it cool for at least 5 minutes before turning out of the pans to cool completely. To make the glaze mix the powdered sugar and cream together with a fork until smooth. Drizzle it over the loaves and let it set up. Wrap a cooled loaf tightly in plastic wrap for an ultra moist breakfast snack bread all week! Are you all about a quick bread recipe? I have just the thing. 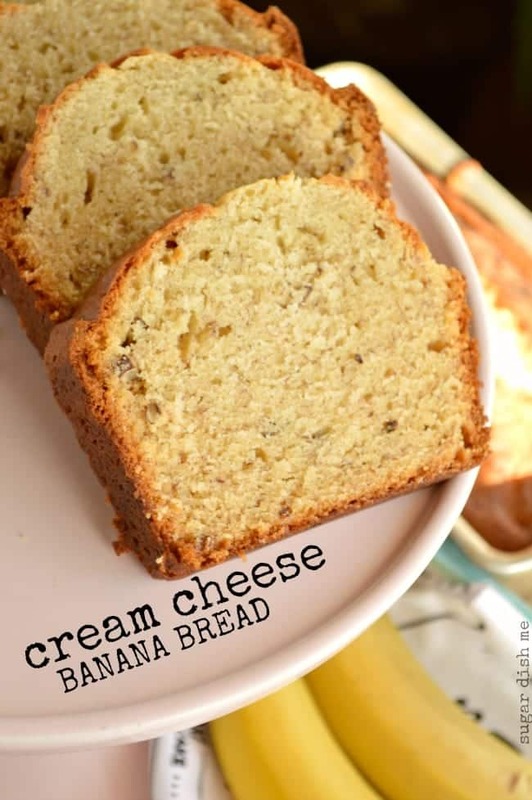 Cream Cheese Banana Bread. This recipe goes bananas (hahahhahaha) every time I share it in social media. It’s a must-try for sure. Strawberry Lemonade Loaf Cake. It’s really a quick bread recipe. You’ll flip. It’s AWESOME. This bread sounds so delicious, Heather! 🙂 I am going to need to bake up a loaf of this very soon. Thanks Carrie! 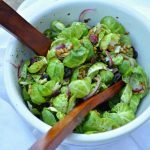 This is such an easy (and totally addictive) recipe! Let me know how you like it! LOL poor little guy! I love how he was worried you would laugh so he didn’t tell you, and you laughed anyway. Totally what I would do; I think sometimes you are my Mom Spirit Animal. Mom Spirit Animal. hahahhaaa that is THE BEST. My sister told him, “Evan, no! you involved a 3rd party!” because he told the school nurse. He is hilarious. P.S I seem to have lost around 1000 subscribers on my blog and I don’t know how, so if you were subscribed, could you resubscribe please? it would really help me out! Hey! 1000 subscribers?! that’s a lot to lose! I’ll check my wordpress RSS. Lol…I’m sorry that I’m laughing, but that story is ridic cute! It’s ok. I laughed too. More than once. 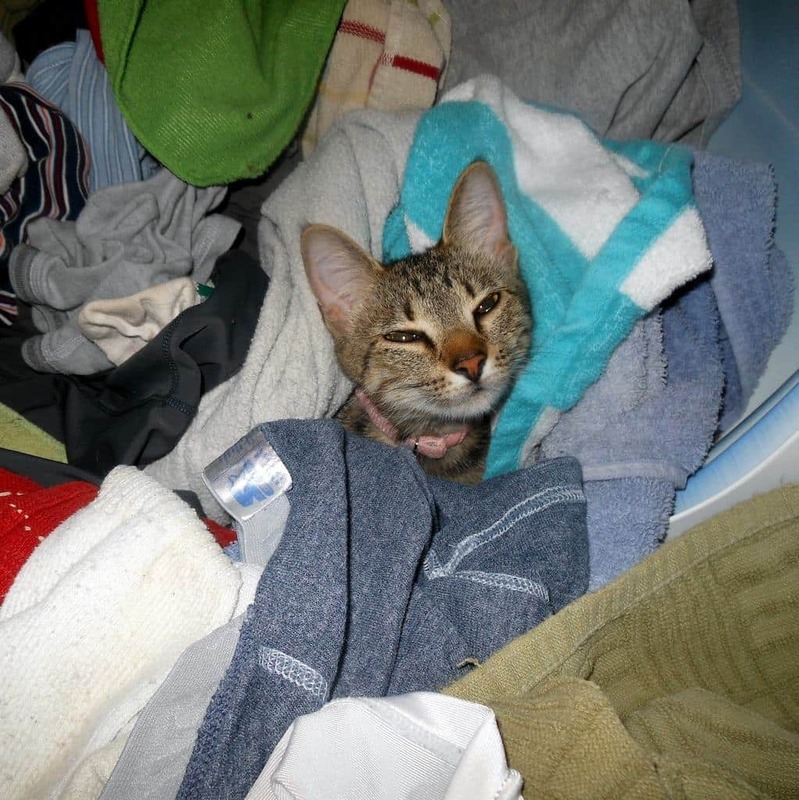 My first thought would have been cat, too. Yup. But no. Apparently we need to beware of flying sticks. Thanks Andi! You are awesome. Have a super holiday!!! Hi Heather! I found you through the Saturday Night Fever link-up. This recipe looks so good! I love all the different components mixed in together. Looking forward to trying this out soon. Hi rik! Thanks! This bread is REALLY easy– one of my favorites!!! 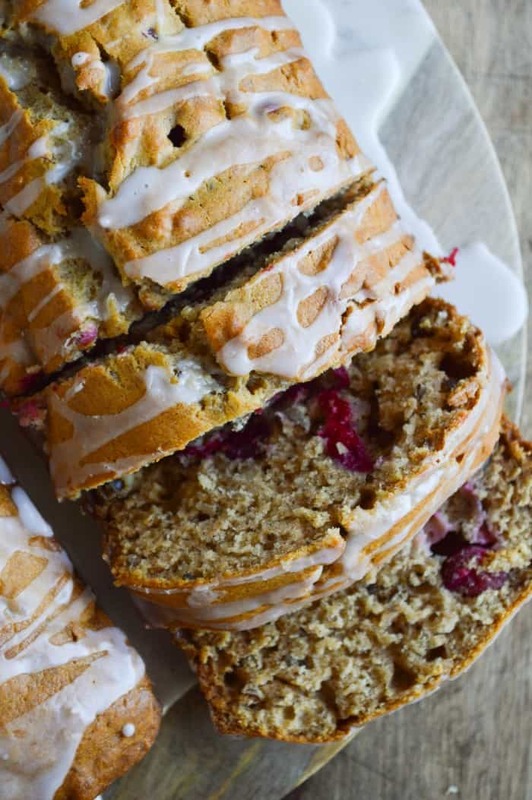 Well, Ms. Heather, your Cranberry Pecan Banana Bread recipe lives on. Lost my Banana Bread recipe, but found yours and looked similar enough to try. Am I glad I lost mine. Made this today, and Wow! it is just as you say. Delicious!! So very moist and tasty. I used my Bunt pan and 30 minutes was ready and perfect. Gonna snoop around in some more of your recipes. 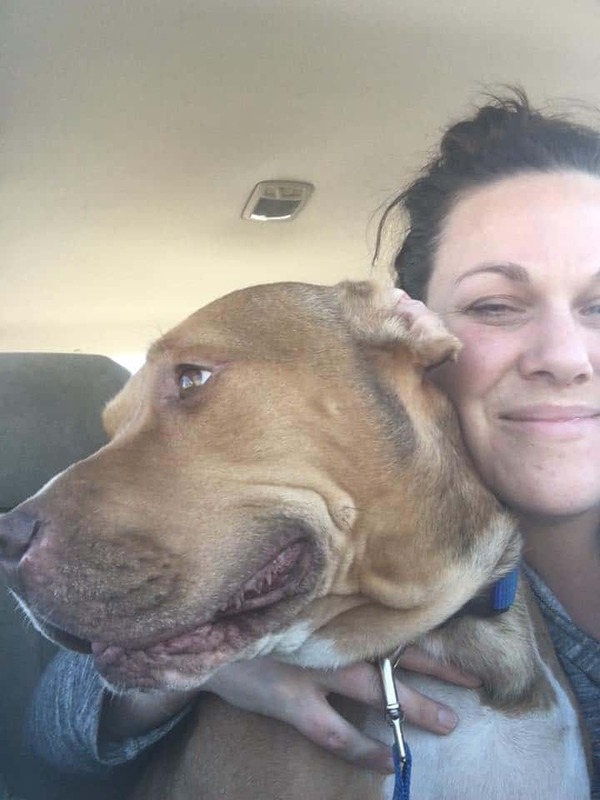 Thank you so much, Sandra! Your comment made my day. Happy 2018! Glad you are here.